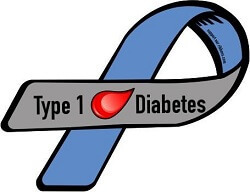 Type 1 diabetes is usually diagnosed in children and young adults, and is also known as juvenile diabetes. In this diabetes, the body does not produce insulin. Typical symptoms include feeling very thirsty, passing urine more often than usual, particularly at night, feeling very tired, weight loss and loss of muscle. A study led by Dr Yong Zhao, from University of Illinois at Chicago established the potential use of umbilical cord blood stem cells in treating Type 1 diabetes. 15 patients with type 1 diabetes aged from 15 to 41 years with a diabetic history ranging from 1 to 21 years underwent a stem cell educator therapy. The researchers checked the patients' progress 4, 12, 24 and 40 weeks after therapy. Six of the patients who had the therapy had some residual beta cell function (moderate type 1 diabetes) and the other six had no residual beta cell function (severe type 1 diabetes). All the patients who had received the therapy also showed improved levels of C-peptide, a biomarker used to measure how well beta cells are working.